I have been active in various aspects of dog training for the past 20 years. My experience includes teaching obedience and agility beginning in the late 1990s in Indiana, 7 years of experience in breed rescue (fostering and training Great Danes and Doberman Pinschers), and 6 years as Search and Rescue dog handler, with dogs specializing in wilderness area search, collapsed structure, and tracking/trailing. 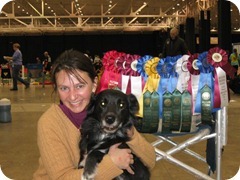 I have recently retired my first agility dog, Border Collie Jett, who was also my last SAR dog. Jett completed her AKC MX and MXJ, then started over at the lower Preferred jump height, completing her MJP-Bronze and MXP2 titles. Currently I'm competing in Master Level AKC and Masters Level USDAA with Border Collie Xen, and just beginning to compete in AKC Novice and USDAA Starters with Xen's daughter, Kate. UAg-I Thunderpaws Blackheart MX MXJ MXP2 MJPB PJCH APD APS APR APK VSD CL4 "Jett"
UAg-I Norwood's Linux Hypervisor CGC MX AXJ OF RN JHD AD AG AJ AS SR CL2 CL3-RSF "Xen"
Norwood's Linux Text Editor "Kate"